I hope everyone had a very nice first day of 2018. I know in my group of friends/acquaintances there are some that are facing some pretty heartbreaking challenges, but for the most part I am seeing a lot of “Happy New Year” posts on Facebook. A lot of people thinking that 2018 will be better than 2017 . . . not getting into what they might have thought 2017 (good/bad/great/horrific) . . . just that they think 2018 will be better. I have a few things I am looking forward to in 2018. I am going to eek out the last day that I think I can get away with posting Christmas stuff. I received several lovely ornaments for Christmas and I want to share . . . although I am sure they will make it on to some form of my social media next year. I wanted to share this year, too. Some I have already posted on Facebook. But I am sharing here too! I have two new ones from Pilgrim Imports. You may have read my post about Lenox ornaments. I used to get their annual snowflake ornament. I did it for years. But the quality started to decline and I was rethinking that whole thing. Then one year I received one that was poorly painted and the little gems were all crooked so I asked to exchange it. Well, they sent me another one that was almost as bad as the first. So I stopped receiving their annual ornament. And asked them to stop marketing to me altogether. Their regular ornaments might be better quality, but if they can’t put out a good quality for their annual ornament I stopped being a customer. I discovered Pilgrim Import ornaments. 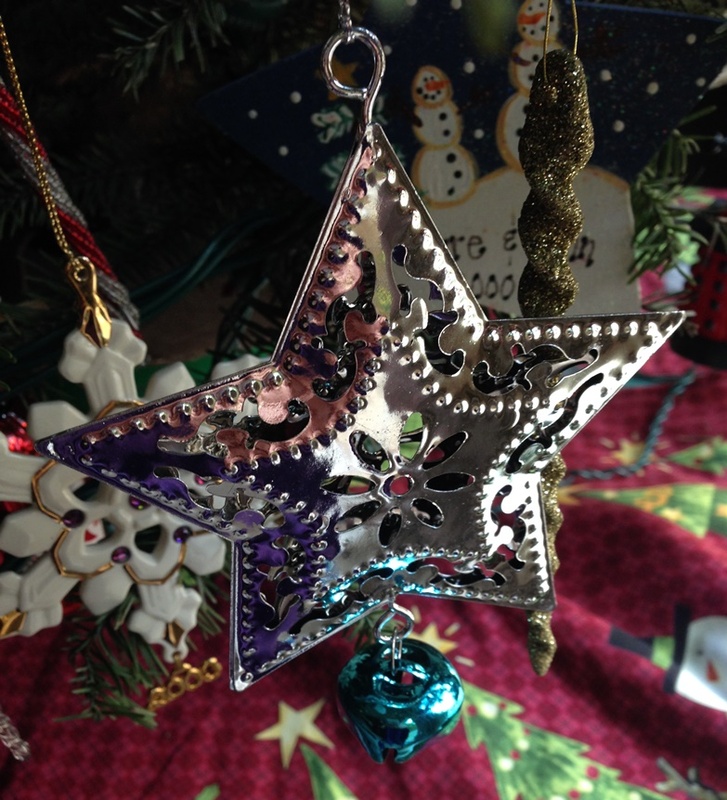 They are metal ornaments with sparkles attached and bobbles hanging from some of them. I love them. If you’ve seen any of my post about Christmas ornaments before you have probably seen one or two of them. This year I received two new ones. 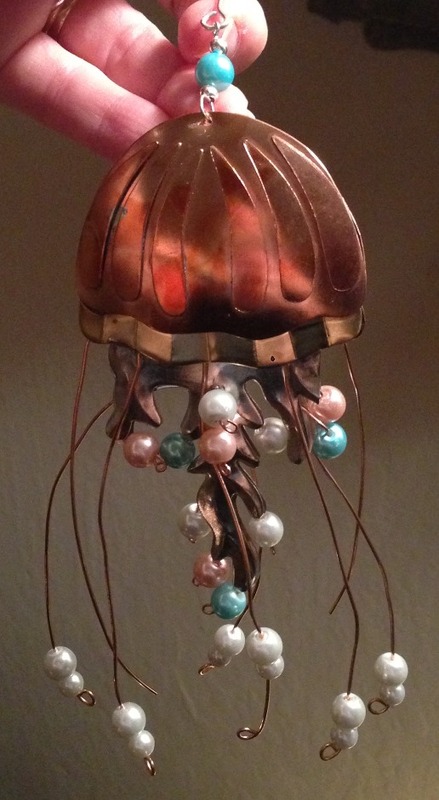 A jelly fish with pink and blue “pearls” attached. 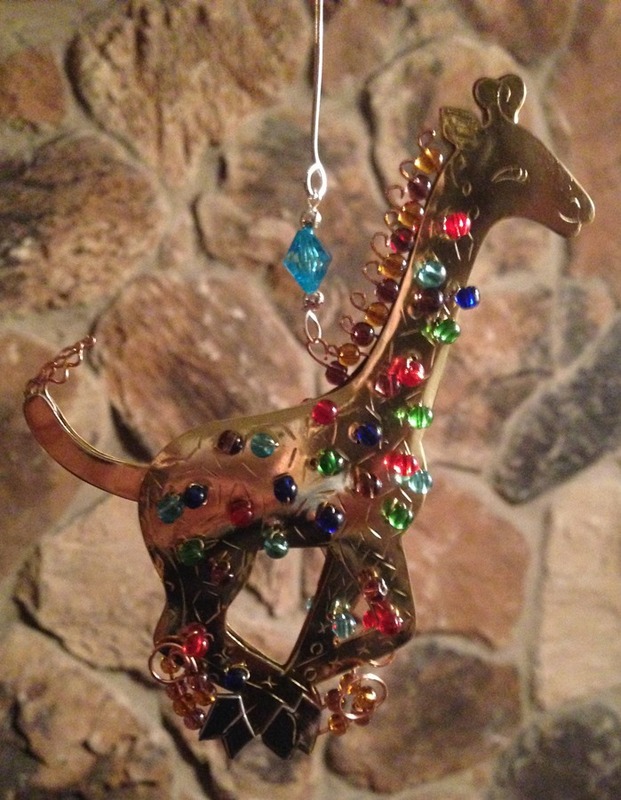 And a giraffe adorned with glass beads! And . 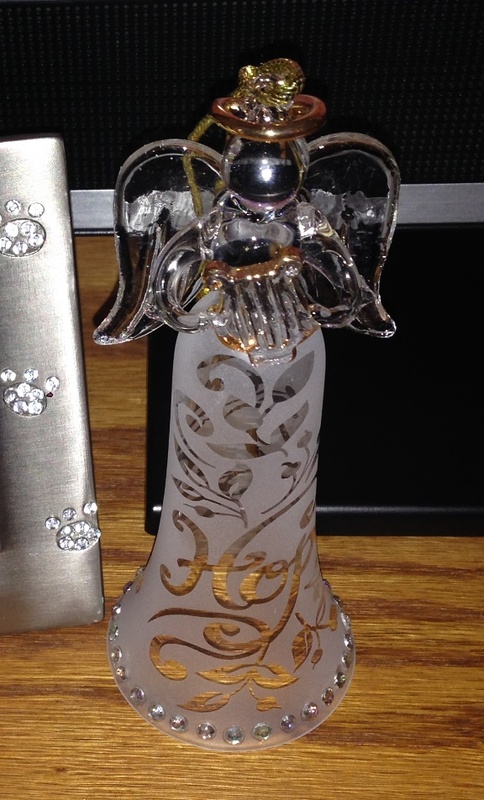 . . as I said, Lenox’s regular ornaments might be fine because we receive a beautiful glass Angel that says HOPE from my sister-in-law. 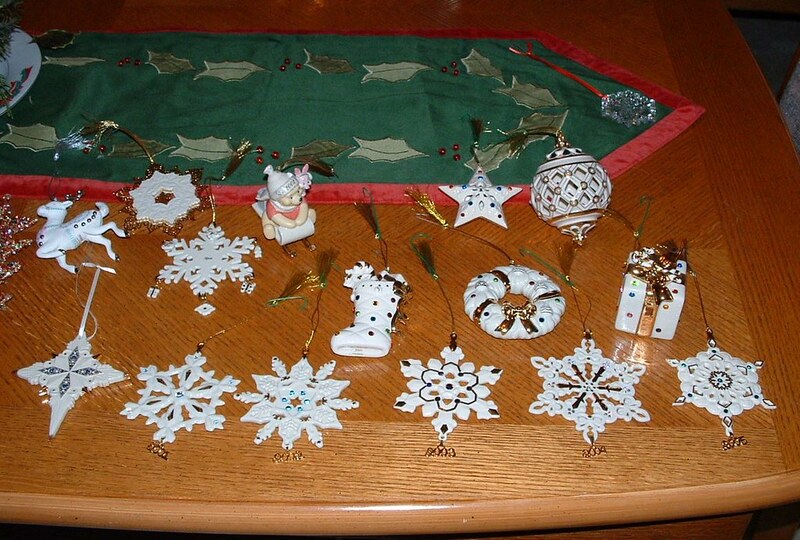 It is also not the regular porcelain (or whatever the snowflakes are made of) type of ornaments I used to collect. I also was gifted a silver star and a beautiful blue butterfly. The angel I received on Christmas and our tree is a little too droopy for me to trust her on it. I don’t think the branches would hold her safely. But the star and butterfly are not as fragile so they went on right away. I am looking forward to decorating with them next Christmas. I am not looking forward to taking down the tree and all the decorations. So much so that I haven’t even started yet. Happy 2018. Is there anything you are looking forward to in 2018? Sometimes I post things that are not in the realm of health, wellness, fitness, and the like, or even what inspires me. Some things I am just sharing. Some things I may write about, because of that “thing”, when you write about it and the act of writing is like therapy. Sometimes, once I bring something up I feel that it is good form to post a follow up of said “thing”. In April I wrote a post sharing that I was kind of sad because I was ending a tradition that had been going on for about fourteen years. It was a collection type of tradition. Where I was a subscriber to an annual ornament. 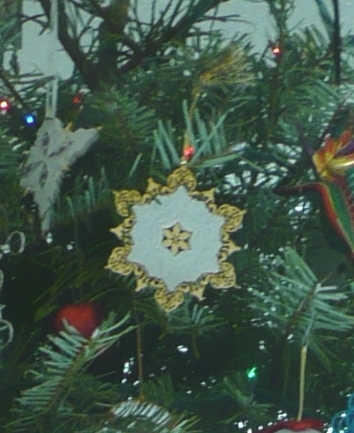 The ornaments were spectacular when we started buying them in 2000, but since then the quality has gone down considerably. In all fairness, I do believe that the price has remained the same or close to it, so I guess that is something. But, the way they are made, now, it is no longer worth the price. I had been thinking of cancelling for a few years, but I was reluctant to let the tradition go. Our Christmas tree is full of Lenox ornaments and it was a joy to collect them. So I was sad to feel the need to stop, but the last ornament I received was THAT bad. I sent the company a letter of cancellation explaining how I used to love their product and I thought it was well made, but that stopped being true years ago. Here is the reply. They acknowledge having received my request for cancellation. But then the letter goes onto say they are happy that I am still interested in their company and product. They extended an invitation for me to visit them online to view thousands of gifts and things. Ha, clearly they didn’t read the reason for my cancellation. I don’t think that I would be interested in buying something from them for a gift considering I think the quality is bad. If I bought something from them for a gift, I would hope the receiver never read my blog otherwise they would know that I bought them a gift of poor quality. I believe, sadly, that they just have this form letter they send out no matter the reason for cancellation. So, I guess it all goes together. 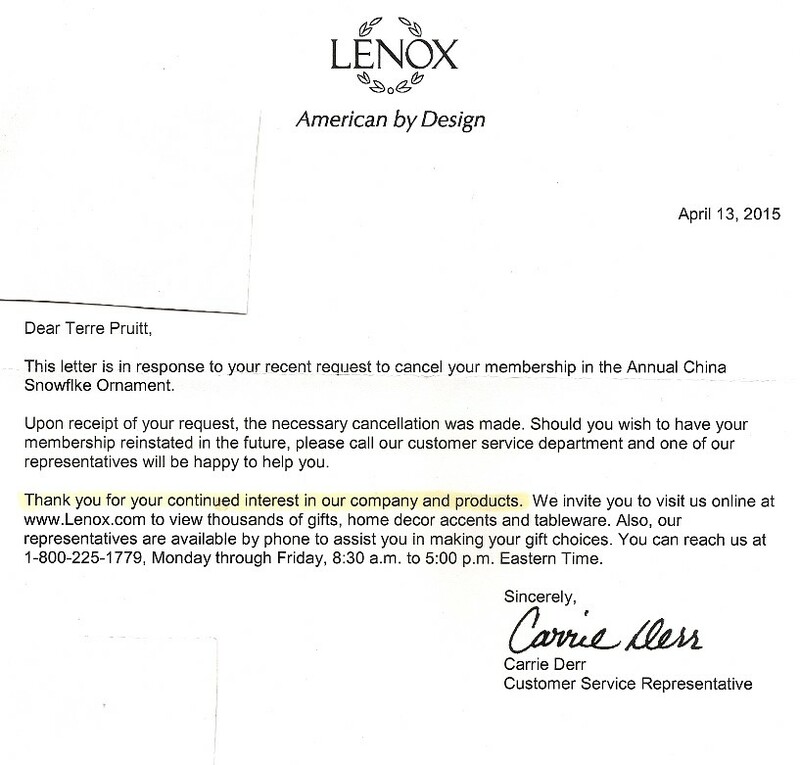 The quality of their product has declined over the years and it seems pretty obvious that they do not care what their departing customers think. I can imagine that they know the quality has declined so they don’t even bother listening to people expressing that opinion. Of course, that is just a thought. I don’t know. 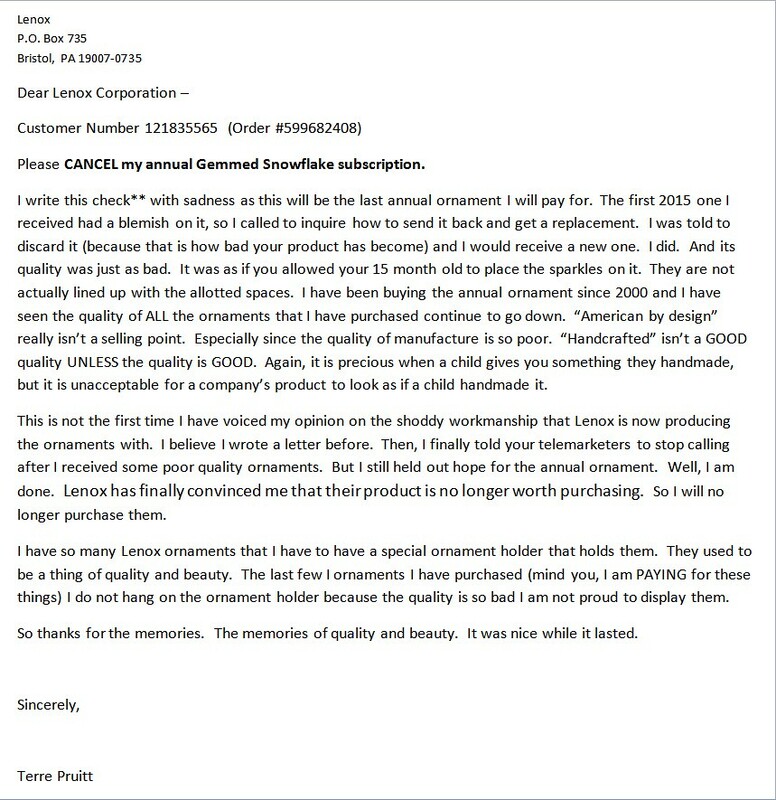 All I know is that their reply did not address my opinion on the quality of the ornaments I have received from them in the past few years. Oh, well, there are many, many, many other companies that make beautiful ornaments. So . . . that is where I will go to spend my money for gifts and ornaments. Well, that is it, I was just giving you the update. Have you ever been the recipient of a form letter that seems to indicate your communication was not actually read? Well, I just had to do it. And it is making me kind of sad. But apparently it has been a long time coming. I wrote about it in 2011. So, it has been five years. It is an end of an era. As I typed the letter I remembered a time when I waited to open the package until my husband got home. It was an exciting moment for me. It was like a big reveal. He did not care as much as I did, but it was exciting to me. Every year I would get excited to see what pretty design they used for the snowflake. What color the “gems” would be. But the last two years I opened it with trepidation. Was I going to have to go through the trouble of sending it back? Well, this year, I didn’t have to go through the trouble of sending it back because when I called and said it was not acceptable they just said to discard it. And they sent me a new one. Yeah, I dreaded opening it too. And for good reason. The “gems” are all crooked and not quite where they should be. My Lenox ornaments are something I collected. They were something I treasured. Well, this was it. I am cancelling my annual snowflake subscription. I really don’t see the point in paying for something of which the quality continues to get worse and worse. So I am sending off a letter of cancellation. Silly, I know. But, to me it is always a little sad when a well loved tradition must be stopped. There are many reasons traditions and customs must change. Some of those reasons are good. But when something has to stop because it just isn’t worth it any longer, that is sad. I could continue to receive them and have that feeling of dread when I do. I think the package actually sat on my counter for a few days before I even bothered to open it this year. See? Not that same. Not the same as being so excited to open it you want to share the experience with your loved one. Not. The. Same. I know this is silly, but . . . . since I brought it up a few years ago, I thought I might as well do a follow up. 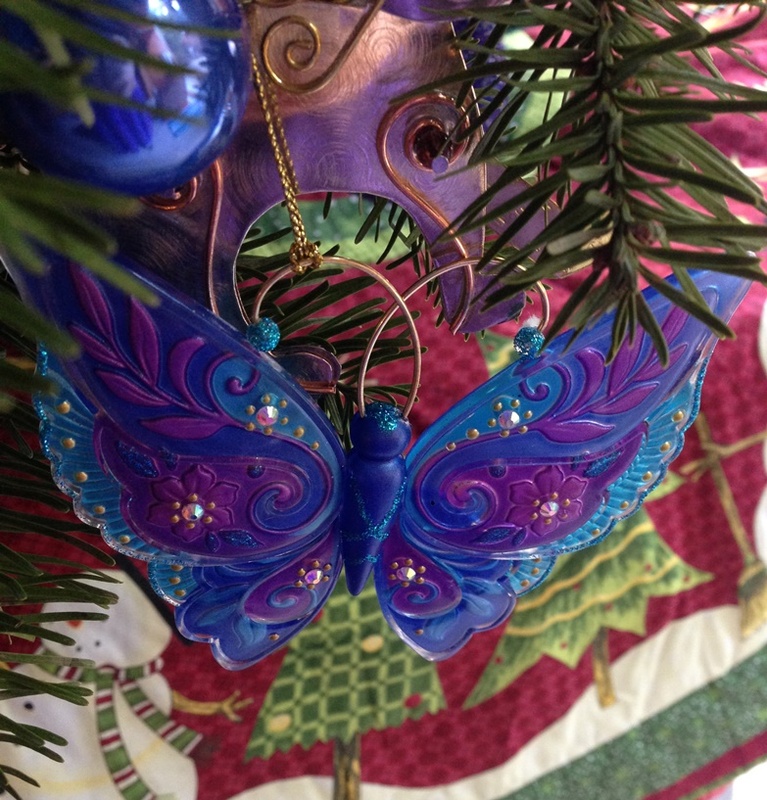 Plus, if you have seen any of my pictures at Christmastime you have seen my Lenox ornaments. They are so pretty and sparkly I always take photos of them and I always share. So, you are familiar with my love of them. Sigh. Handcrafted really is not a good selling point unless the quality of it is good. And, the boxes say, “American By Design”. Means nothing, especially when the quality is bad. When I think about cancelling, I don’t want to. I still want to receive my pretty ornament each year. But then when I think about the dread and the quality I have been receiving . . . I just gotta do it. Perhaps there is another collector type of ornament I can collect? Do you have anything you collect?